"Access to information held by public authorities is a fundamental human right which should be given effect at the national level through comprehensive legislation [...] based on the principle of maximum disclosure". in Com 2002/0247 the EU Commission declares an "area of freedom, security and justice" with a "guarantee for the principles of democracy and respect for human rights". Is the work for human rights of the Council of Europe and OSCE no longer necessary for EU member states? The human right to information is part of the right to freedom of expression, which is confirmed by international human rights treaties, specifically by the International Pact of Civil and Political Rights (ICCPR Article 19), and the Article 10 of the European Convention on Human Rights. 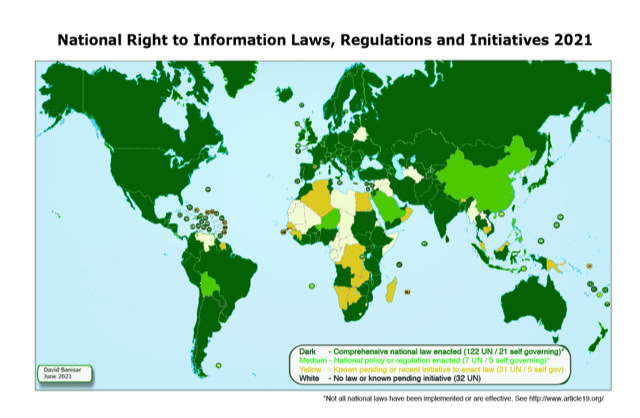 In more than 90 states worldwide with more than 5.5 billion inhabitants access is secured by freedom of information laws. 18. Article 19, paragraph 2 embraces a general right of access to information held by public bodies. Such information includes all records held by a public body, regardless of the form in which the information is stored, its source and the date of production. Article 10 of the European Convention on Human Rightsand Fundamental Freedoms guaranties freedom of opinion and freedom of information. The European Court of Human Rights confirmed in cases Sdruženi Jihoceské Matky./. Czec Republic, No. 19101/03 of 10. July 2006, GERAGUYN KHORHURD PATGAMAVORAKAN AKUMB v. ARMENIA: No. 11721/04 and TÁRSASÁG A SZABADSÁGJOGOKÉRT ./. Ungarn No.37374/05 this human right includes access to information, i. e. access to public documents. "The function of the press includes the creation of forums for public debate. However, the realisation of this function is not limited to the media or professional journalists. In the present case, the preparation of the forum of public debate was conducted by a non-governmental organisation. The purpose of the applicant's activities can therefore be said to have been an essential element of informed public debate. [...]" In the OSCE nearly all states have adopted freedom of information laws with the expeption of Andorra, Belarus, Cyprus, the Holy See, Kazakhstan, Luxembourg, Malta, Mona­co, San Marino, Spain, and Turkmenistan. Many petitions and complaints to Germany authorities (government, administration, parliaments, courts, NGOs) 2001 to 2012 did not help. 2 dosen petitions in the years 2001 to 2011 to German parliaments were only partly successfull. 5 federal states (Länder) still lack freedom of information laws. 5 complaints 1 BvR 1981/05, , 1 BvR 2565/05, 2 BvR 1033/07, 1 BvR 238/09 to the German constitutional court on access to public information did not succeed. Supports EU human rights in member states? 18.April 2002 the President of the EU Commission was made aware of the lack og freedom of information laws in Germany (Appendix 2). In his reply 8 May 2002 the Commission mentions plans of the German Bundestag and writes: "(The) Council of Europe is currently drafting a Recommendation in this field (on access to public documents). In the end, Germany will most certainly follow the example of its European partners" (Appendix 3). But afterwards the Parliament of Baden-Württemberg voted against a freedom of information law. However 24. May 2002 the Commission states again: "it is beyond the Commission’s remit to take any form of action against Member States that fail to pass laws on freedom of information and there is no way in which the EU institutions could compel Germany to adopt such rule". 11.July 2002 the European Parliament, writes to lack the possibility to influence Germany on this matter. (Appendix 4). The plans of a federal freedom of information law failed 2002. It was proposed 27. February 2004 that the EU Commission gives a directive on freedom of information (Appendix 5). The answer 23. March.2004 says, that the Commission has no possibility to promote freedom of information in Germany and refers to the European Court of Human Rights (Appendix 6). The European Ombudsman suggests 7. July 2004 to address the Council of Europe (Appendix 7). 5. May.2002 the European Convent got the suggestion to include access to information in its work on the European constitution. 5. July.2002 the Convent refers to the public discussion. The draft of a Constitution for Europe lacks access to information for member states. 17. January 2005 the EU Commission again sees no possibilities to promote human rights in Germany, although human right violations where 17. November.2004 shown (Appendix 8). 14. July 2005 the EU Commission suggests a complaint to the European Court of Human Rights (Appendix 9). Unfortunately both Keim ./. Deutschland: application No. 41126/05, Keim (II) ./. Deutschland application No. 31583/07 und Keim (III)./. Germany No. 46953/09 on access to information failed. 10.December 2005 a petition to the European Parliament about human right violations in Germany was filed (Appendix 10). The European Parliament answered 16. January.2006 not to admit the petition, because human rights are not covered by EU laws (Appendix 11). Although 9. February 2006 the EU Treaty was quoted (Appendix 12), the EU Parliament upholds 22.2.2006 the refusal (Appendix 13). The EU Network of Independent Experts in Fundamental Rights answers 16. July 2006 that "the contract of the EU Network of Independent Experts on Fundamental Rights finishes in September 2006 and will not be renewed"(Anlage 14). European Union Agency for Fundamental Rights (FRA) has the tasks e. g. to monitor: "The Agency’s work focuses clearly on the situation of fundamental rights in the Union and its Member States". Therefore the FRA was informed 1. March 2006 about human right violations in Germany. However the FRA misunderstands 29. March 2007 information on e. g. lack of freedom of information laws as individual complaint and writes that "The European Commission is empowered to deal with breaches of Community law in relation to fundamental rights, the Council of Europe has well established human rights mechanisms" (Appendix 15). The answers of the EU Commission, the EU Parliament, the European Union Agency for Fundamental Rights (KOM(2005)) and the EU Ombudsman document that EU does not promote access to public documents in member states. This is left to the Council of Europe. Nothing is done for an "area of freedom, security and justice" (Com 2002/0247) with a "guarantee for the principles of democracy and respect for human rights". EU does not even monitor human rights violations in member states. This proves the necessity, that the Council of Europe, OSCE and UN are active to monitor and secure human rights in Germany. To improve access to information in Germany is also important because the Group of States against Corruption of the Council of Europe 2009 (GRECO) saw severe shortcomings in the fight against corruption in Germany (Appendix 16). 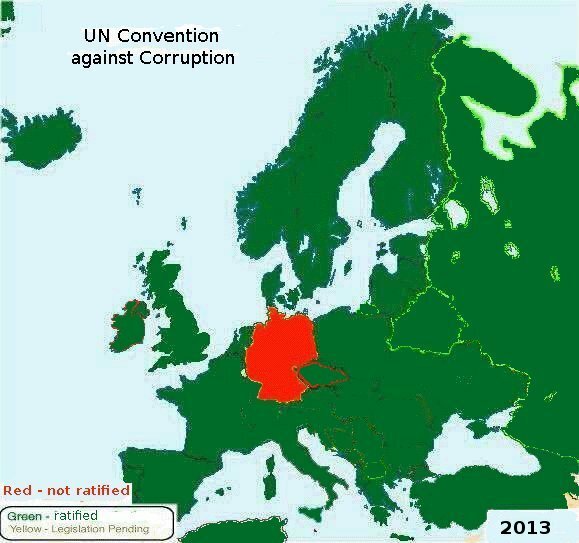 The UN Convention against Corruption is ratified by 154 states wordwide but not by Germany due to insufficient rules about bribery og members of parliaments. GRECO made 2009 suggestions to improve transparency of party funding in Germany. The federal parliament Bundestag refused 2011 (see Committee of Interior Affairs "Ausschussdrucksache 17(4)283 des Innenausschusses") to comment on this proposal with the majority of the votes of the coalition parties CDU/CSU and FDP. In summery EU does not care about access to public documents in member states, which is important for informed voters, freedom of the press and therefore a modern democracy in the information age. Therefore the engagement of CoE and OSCE is important. COM(2010) 573 final: The Charter of Fundamental Rights of the European Union applies primarily to the institutions and bodies of the Union (Article 51(1) of the Charter). 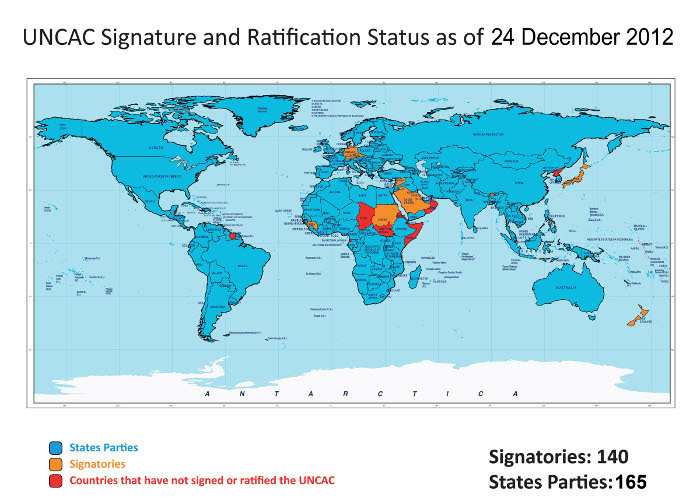 Article 51(1) of the Charter also stipulates that the Charter applies to the Member States only when they are implementing Union law. It does not apply in situations where there is no link with Union law. 05. December 2011: The Office of the Commissioner will take notice and thanks for the information. European Union Agency for Fundamental Rights (16. April 2013): "We regret to inform you that our mandate does not give us the authority to monitor particular EU Member States for the purposes of determining the existence of human rights violations."